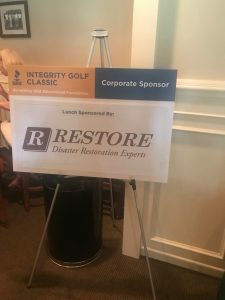 Restore Construction, Inc. proudly sponsored the lunch at the 24th Annual Integrity Golf Classic at the Inverness Golf Club yesterday, July 16, 2018. This event benefitted the BBB Educational Foundation, a 501(c)(3) non-profit organization. The Foundation’s chief initiative is to award four student scholarships each year to students entering college. The Foundation also proudly offers the BBB Speakers Bureau, and this bureau provides resources to consumers, businesses, and military personnel to protect and educate these individuals. It also offers free workshops to military members and veterans. We were happy to sponsor such a great organization and event again this year. The outing was a hit!